Here is the final card for Mets' 2nd baseman Jerry Buchek (#277). This was the first of three Buchek cards I acquired. 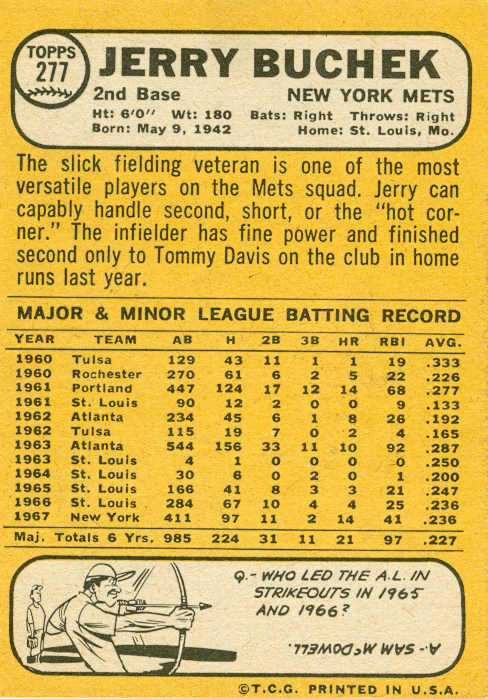 Jerry's 1967 card is in the high-numbered 7th series, so I didn't get that until years later. 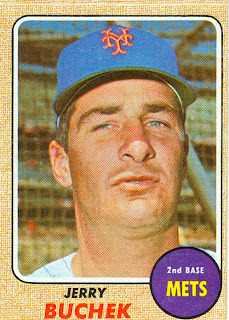 By the time I jumped on the major-league baseball bandwagon in May 1967, Buchek was the Mets' regular 2nd baseman. I didn't realize until checking his stats for this column that he only became a Met on April 1st that year, about a week before the start of the season. 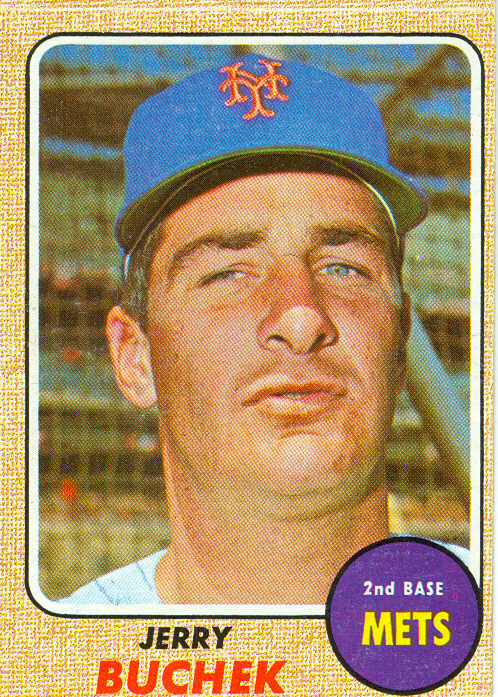 His 1967 card shows him in full Mets' gear, which is an amazing and unexpected feat by the Topps photography department, given their record of lagging behind the curve with updated photos for the 1967-68-69 Don Lock, 1968-69 Woody Fryman, 1968-69 Turk Farrell, 1968 Tommie Aaron, etc, etc, etc. Buchek was signed by the Cardinals in 1959, and played 4 seasons (1960-63) in their farm system as a shortstop, making brief appearances with St. Louis in 1961 and 1963. He made the Cardinals for good at the start of the 1964 season, playing in 35 games as a SS-2B backup, as well as a few appearances in the World Series. 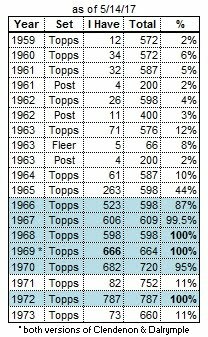 During the 1965-66 seasons, although still a backup, he began playing much more at 2nd base than in previous seasons. 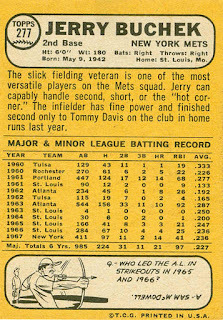 A week before the 1967 season, Jerry was traded to the Mets (along with pitcher Art Mahaffey) for veteran shortstop Ed Bressoud and outfielder Dan Napolean. Buchek alternated with veteran Chuck Hiller at 2B during April, then started almost every game at 2B during May, June, and July. For the remainder of the season, he alternated between 2nd, 3rd, shortstop, and the bench. In 411 at-bats, he only managed to hit .236, which probably hastened the end of his career. 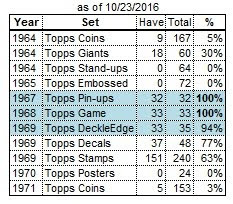 The emergence of rookie 2nd baseman Ken Boswell severely limited Buchek's playing time in 1968. He was primarily relegated to the bench, although he made a few dozen starts at 3rd base spelling veteran Ed Charles. After the season, Jerry was traded back to the Cardinals, for minor-league pitcher Jim Cosman. Before the start of the 1969 season, he was flipped to the Phillies in exchange for 1st baseman Bill White. Buchek spent the year with the Phillies' triple-A team in Eugene, Oregon before retiring.